In order to train future pastors, our church has two Seminary's, one here in St. Louis. Students attend a 4 year graduate program; 3 years are in the classroom and one as "vicar/student" in an existing congregation. There he spends one year receiving practical experience and skills to complement his classroom education. View it as a one year internship. Beautiful Savior has participated in this partnership with our Seminary for the last 10 years or so. We also have other students that help part-time. Below is our present vicar/student; linked is our past vicars. It is a joy and pleasure to both student and Pastor and congregation in being a part of the next generation proclaiming the GOOD NEWS OF JESUS CHRIST! Vicar James Thomas and his family are blessed and delighted to be assigned to Beautiful Savior for vicarage. James Thomas is a native of St. Louis, MO and resides in Creve Coeur, MO with his wife Melissa and his three children Mia (12), Ethan (5) and Matthew (6 months). Before entering seminary, James worked 15 years (1996-2010) in the wholesale mortgage industry here in St. Louis, specializing in FHA and VA residential lending. James also worked as a marketing representative for the St. Louis Symphony Orchestra in midtown, St. Louis (1994-1996) a job that provided much enjoyment. 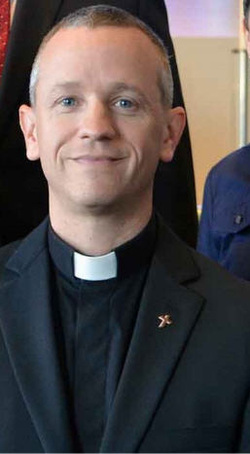 In addition to his role as Vicar, James also serves as a Lieutenant in the United States Coast Guard Reserves, managing a Disaster Area Response Team whose primary mission includes Law Enforcement and Search and Rescue type operations, primarily during floods and other national disasters. Vicar completed his B.S. in Communications Management at Washington University in St. Louis and was a 1993 graduate of Lutheran High South, here in St. Louis, MO. In his off time, James enjoys hiking, golf, cooking, travel and spending time with his family.